New Busy Bee Candles Magik Beanz are simply amazing! Super strength mini wax tart melts to use in your tart warmer. Place a minimum of 5 Magik Beanz in the reservoir of your tart warmer (tea light or electric warmer). You can use a single fragrance for a huge hit of your favourite or mix various scents to create something new and possibly unique to you! Take a look at our Magik Beanz Recipes for inspiration – Magik Beanz Recipes. Light a tea light beneath & sit back (or switch on your electric warmer). The fragrance wave is on it’s way! Add more Magik Beanz of the same scent or experiment as you need. Start all over again with a fresh batch of Magik Beanz when you feel like it. These are the strongest scented home fragrance wax tart product we know of. They come to you in lovely little resealable pots with an average of 15 Magik Beanz per pot. 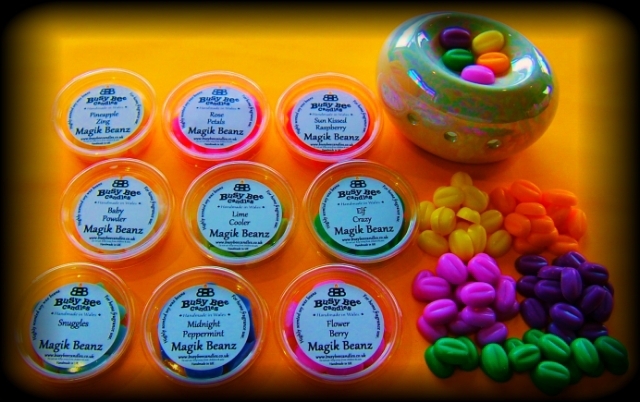 Take a look at our full range, around 200 fragrances, here – Magik Beanz. Most of all, have fun experimenting with Busy Bee Candles Magik Beanz. Have just started using busy bee ! I have tried the wax tarts which were ok but not really strong enough for me ! So I thought I would give these magik beanz a go wow !!!!!!! They are fab and smell strong and fantastic ! Thank you !!! Will definatly be back for some more ! I am so happy that I discovered this company via twitter. I have stopped using any other candles now and the magik beanz are amazing! The scent lasts ages and when I have got one burning downstairs can smell it right through house! My faves (so far!) are orchid, antique sandalwood and snuggles. 2 of my friends have bought since smelling mine and I have bought for my mum! Delivery is super fast too!! I switched from the very lovely but pricey Y candle to these magik beanz and they are amazing! Scents are so diverse its fantastic. Although I want to just eat the cola cubes they smell so nice ha!